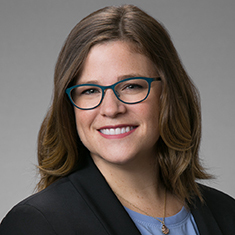 Emily Rochy has broad experience representing individuals and corporations in varied and complex commercial litigation and white collar criminal matters. Emily represents clients in state and federal courts throughout the country on a multitude of issues, including employment discrimination and non-competition, environmental regulatory litigation, trade secret protection, as well as numerous other complex commercial litigation issues. Emily has an active pro bono practice. She has represented refugees seeking asylum based on the threat of persecution in their home countries. One client received asylum from religious persecution in Mali and is now living and thriving in the United States. Additionally, Emily was a volunteer attorney for the Clemency Project 2014, an initiative that provides legal assistance to federal prisoners seeking commutation of their sentences on the basis that they would have received a lesser sentence had they been sentenced today. Prior to joining Katten, Emily was an associate at a large corporate law firm, where her practice focused on labor and employment and defense of personal injury and wrongful death matters arising from asbestos exposure. Shown below is a selection of Emily’s engagements. Representation of a global energy company in employment discrimination matters. Provision of advice and counseling to multiple clients on employment contracts, including covenants not to compete and indemnity provisions. Defense of international steel company in OSHA whistleblower retaliation investigation. Representation of international offshore drilling company in enforcement of covenant not to compete and confidentiality provisions, including obtaining temporary restraining order and injunction. Representation of an international shipping company charged with violations of the Act to Prevent Pollution from Ships and MARPOL 73/78. Representation of oil refinery in defense of alleged violations of state safety and health regulations, including process safety management standard and other safety regulations. Representation of a petroleum exploration and development company in lawsuit for misappropriation of trade secrets. Representation of Norwegian software company in lawsuit involving termination of distributorship agreement. Representation of an oilfield contractor in enforcing indemnity agreement in personal injury action. Provision of advice to a major drilling and production company in developing policies and procedures applicable in employee contractor man camps. Representation of court-appointed receiver of salt water disposal company relating to management of company and litigation brought by the receivership. Representation of a multinational petroleum refiner in wrongful death action based on premises liability for exposure to asbestos. Representation of an entertainment company in arbitration of breach of contract claims against sponsors. Lead briefing attorney for entertainment company on appeal to Texas Court of Appeals and Supreme Court in suit relating to manufacturing defect against a light manufacturer and distributor. Representation of Norwegian-owned software company involving rights and obligations under limited liability company agreement. Co-author, Texas Court: When Are You Liable for a Subcontractor's Safety Negligence?